Bishop Nicholas has written to all clergy in the Diocese of Salisbury asking them to pray for the upcoming UN Climate Change summit in Paris and to support the Diocese’s Green Ribbon campaign calling for meaningful action. The Church has a strong Biblical and historical basis for caring for the environment. We care because it is God’s creation not ours; we care because biblically we are called to do so; we care too because we are called to love our neighbour as ourselves. One of the Five Marks of Mission developed by the Anglican Communion in the 1980s is, “To strive to safeguard the integrity of creation, and sustain and renew the life of the earth.” This is integral to evangelism and mission. “The Diocesan Environment Group has been working on a number of creative ideas to help you and your churches join in with this campaign. As a simple action I would urge all Churches in the Diocese to use the special prayers they have produced on Advent Sunday, which falls on the eve of the Summit.” You can read and print off the prayers here (pdf). 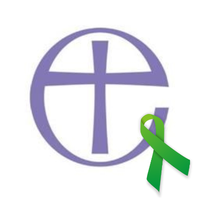 Another suggestion backed by the Bishop is the wearing of green ribbon badges to show our support for action on climate change. For clergy who are daring, we are calling on them to swap to a green clergy collar – those of us who have tried this have found it a big conversation starter. And on Facebook and Twitter, you can add a green twibbon to your profile to support the campaign for action at Paris. Grab one here – it looks just like the image with the green ribbon at the top of this story. Ambitious churches might also consider wrapping a Climate Action Paris 2015 Green Banner around their church towers or spires. We are also arranging local pilgrimages on Advent Sunday November 29 across the Diocese. For more information and orders of green ribbons please contact Miriam Longfoot at Church House – miriam.longfoot@salisbury.anglican.org or 01722 411922. We are also seeking to recruit ‘Green Angels’ to support the campaign (£25 funds 100 ribbons). Please let Miriam know if you can help. Nationally there is a Pilgrimage Walk to Paris (which at least two members of our Diocese are undertaking). There is also a Cycle Ride to Paris and national rallies across the country. For more information see the Tearfund website. There too you will find prayer resources. Hope for the Future (a national group allied with Christian Aid, CMS, Us, the Iona Community and Tearfund amongst others) can help you personally lobby your MP or to hold group lobby write ins. For more details on these Diocesan Events please see the Environment Group’s new Facebook page. This entry was posted in Climate, News, Salisbury. Bookmark the permalink. Both comments and trackbacks are currently closed.